Brown Pundits: Happy days for (Iranian) Bahais!!! Message of peace: Baha'u'llah, the 19th-century founder of the Baha'i faith- "Consort with all religions with amity and concord, that they may inhale from you the sweet fragrance of God," reads the inscription. "Beware lest amidst men the flame of foolish ignorance overpowers you." Such a violent backdrop makes Ayatollah Masoumi-Tehrani's gift all the more remarkable. 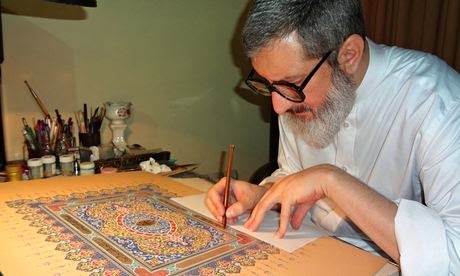 A trained calligrapher and painter, the ayatollah has produced a large illuminated work of art featuring passages from the writings of Baha'u'llah, the 19th-century founder of the Baha'i faith. Although I believe Islam is the religion chosen by God, I cannot reject such words.